The Starr Forum event commences in the Kirsch Auditorium with a panel discussion featuring Robert Rotberg, Belfer Center, Harvard’s Kennedy School of Government; Susannah Sirkin, Physicians for Human Rights; and Marcus Bleasdale, member of the DARFUR/DARFUR team. The event concludes in the TSMC Lobby with the DARFUR/DARFUR exhibit and reception. 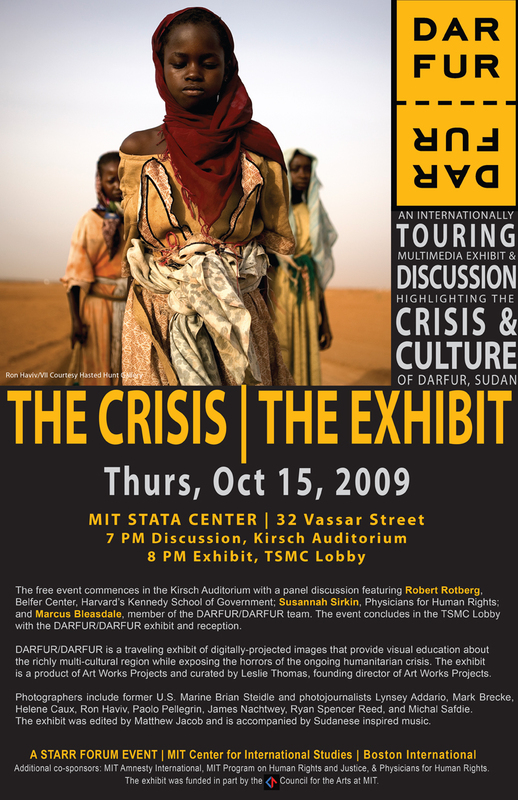 DARFUR/DARFUR is a traveling exhibit of digitally-projected images that provide visual education about the richly multi-cultural region while exposing the horrors of the ongoing humanitarian crisis. The exhibit is a product of Art Works Projects and curated by Leslie Thomas, founding director of Art Works Projects. Photographers include former U.S. Marine Brian Steidle and photojournalists Lynsey Addario, Mark Brecke, Helene Caux, Ron Haviv, Paolo Pellegrin, James Nachtwey, Ryan Spencer Reed, and Michal Safdie. The exhibit was edited by Matthew Jacob and is accompanied by Sudanese inspired music. A CIS Starr Forum event brought to you by MIT Center for International Studies and Boston International. Additional co-sponsors include the MIT Program on Human Rights and Justice; MIT Amnesty International; and Physicians for Human Rights. The event was funded in part by the Council for the Arts at MIT.